If you’re a WLAN engineer I’d argue the answer is a resounding yes. For years I got along without a spectrum analyser without any notable problems, but as Wi-Fi has grown in importance I’d now not be without one. Whilst you might go months without needing to go near one, the day will come when your trusty analyser will save you hours of work and possibly a great deal of money. Today I used one on two separate troubleshooting jobs. In the first case I was responding to an issue where an individual reported that his Wi-Fi connection was terrible. It turns out not to be the case; his Wi-Fi connection was really good – there’s something else as yet unidentified as play causing the problems. However, I was working with the client he told me that he was working on deploying a new video comm’s link for a customer of his – a wireless (but not *Wi-Fi*!) video intercom type device. As the intercom units didn’t use 802.11 to communicate I couldn’t use a packet sniffer to observe what was going on over the air. Therefore this was a job for the trusty Wi-Spy DBx tool! I fired it up and he fired up his video comm’s link. After a few screeches of feedback I directed his attention at the Channeliser software. (as below). But for now – good work Wi-Spy DBx! The next call on my to do list was to visit researcher who had reported a ‘flaky Wi-Fi connection’. Whilst she was happy to use ‘wires’ (as most pragmatic boffins are), I wanted to ensure there were no underlying issue with the wireless provision in her area – on a point of pride as much as anything else. She demonstrated quite quickly that her laptop had issues connecting in the office. It occasionally leased an IP OK, but more often than not it failed. The laptop worked without problems elsewhere so clearly it was something to do with the local system or environment. I set up a few diagnostics on the system and set ping going on her laptop (having finally leased an IP). Immediately I noticed some very long round trip times; 500ms to 2s, plus a whole bunch of lost packets. This almost certainty means lots of layer 2 re-transmissions (LAN in this area is rock solid). More than likely, I thought, there would be some source of interference. 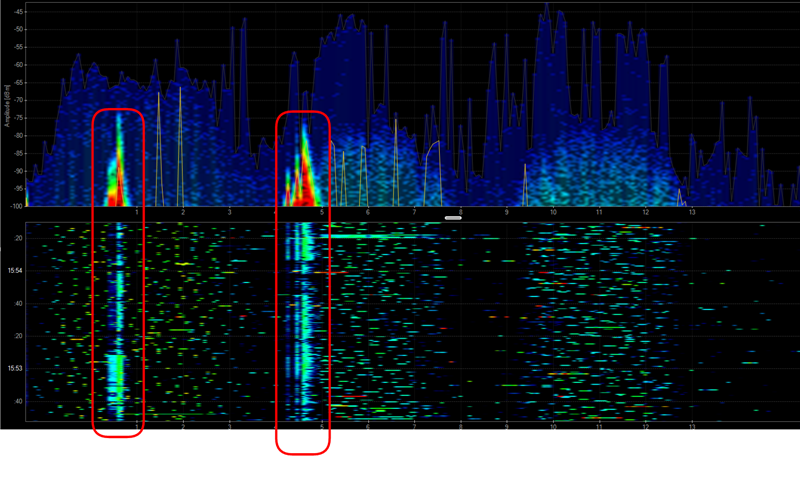 Immediately it was obvious that on two of the 2.4GHz channels there was a evidence of an interfering device. I showed this to the researched and she helpfully noted that the lab area we were in was currently used by some of her colleagues for experiments involving Electromagnetic Radiation! Once again the trusty DBx had saved me a whole heap of troubleshooting. The trace proved the cause of a problem, leaving no room for doubt. In this case there was no ‘fix’ – the research took clear priority over the Wi-Fi, so no remedial action was taken. In principle the closest APs could have been manually set to channel 11 which was clear. (As an aside, the 5 GHz band was clear so had the laptop had a 5 GHz radio this could have been used. We also could have reconfigured the APs to use channel 11 as this was clear, had a wired connection not been available). So, could I have done this without a Spectrum Analyser? Well, without a spec’-analyser you can infer the presence of non Wi-Fi interference, but it really is hard to actually *prove* categorically. One thing which I will be doing as follow up is looking at our Airwave monitoring software and retrospectively hunting for evidence of the problem, however I feel that in this instance, it was definitely the right tool for the job.